Announcing the Adyn’s Dream Bluegrass @ Little Fish Fundraiser on Sunday, 9/25! We are so excited to announce our next event, the Bluegrass at Little Fish Brewery fundraiser on Sunday, September 25th from 3:00 – 7:00 pm! This will be a fantastic afternoon & evening with some of the finest bluegrass to hit Athens county in years! We are excited to welcome Billy Strings to Athens! 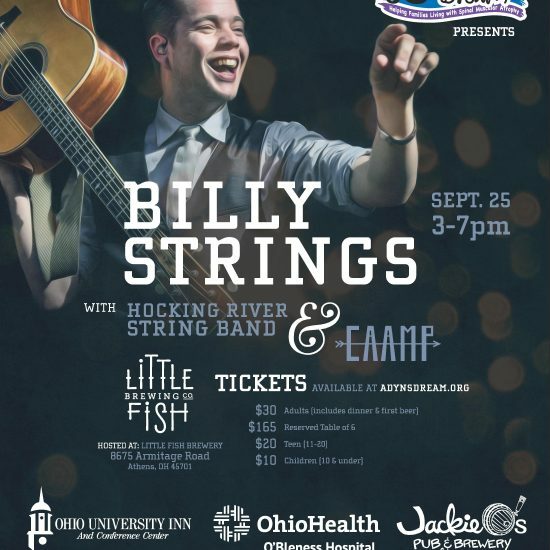 Billy is one of the finest bluegrass guitarists in the country and will light up the stage with his mastery of the guitar and banjo. 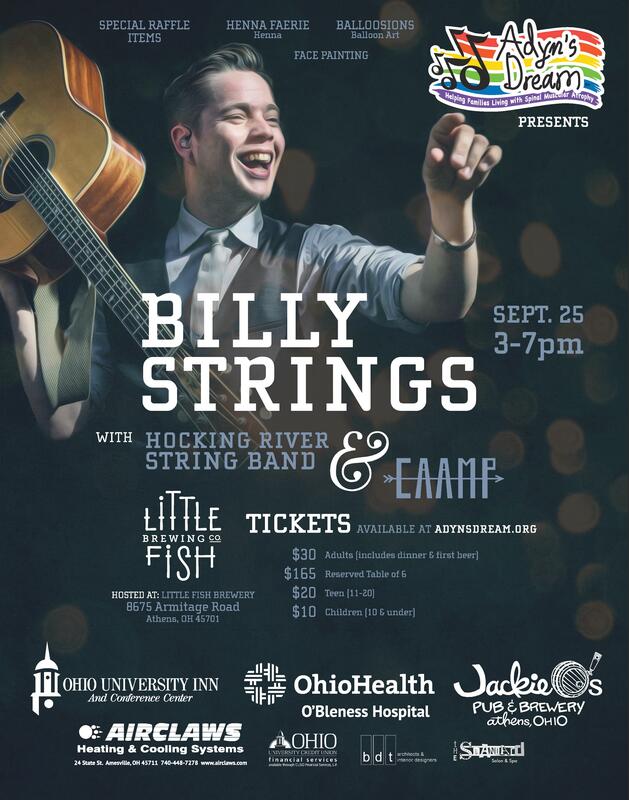 We also are grateful to have regional favorites, the Hocking River String Band, picking for you and sharing some tunes off their new album! And starting the event off will be the up & coming duo, CAAMP! CAAMP was founded a couple years at Ohio University, and the duo have relocated to Columbus to continue to grow their success! Wondering if this event is “kid friendly”? Wonder no more! We work hard to not only make Adyn’s Dream events kid friendly, but kid welcoming! Besides having a special kids menu for dinner, we have invited some pretty awesome friends to bring the kids party! Our friend Joe, from Balloosions, is coming back to show his support of Adyn’s Dream and make your little one some pretty incredible balloon sculptures! We are also so excited to have Adyn’s dear friend Penni, the Henna Faerie, attending her first event! She the Henna Faerie for a reason – she is absolutely one of the very best all natural henna artists you’ll ever meet. She’ll be prepared to give children of all ages beautiful henna tattoos to support Adyn’s Dream. We are also working to have a face painter present for the event as well. So yes, along with the awesome kids play area at Little Fish – we will have plenty of fun activities for the young ones! Needless to say, the music is going to be top notch, and with the event being held at the Little Fish Brewing Company – incredible beers of varieties will be on tap for you to enjoy. Tickets are on sale now (click here to purchase), and every adult ticket includes your donation, dinner, and first beer! Child (includes 1 child dinner) & Teen (includes 1 adult meal) tickets are also available. We even have reserved seating picnic tables at a reduced price for groups of 6 people! Come check out Ohio’s best new brewery (as awarded by Rate Beer), enjoy some of the finest music around and help raise money to support families with children born with Spinal Muscular Atrophy! Here’s the link to follow to purchase your tickets!